MAGNOLIA, MS (March 17) – Brooke Tatnell will always feel a special kinship to Sammy Swindell. The Australian driver appreciates everything the three-time World of Outlaws champion did to help him start his sprint car racing career in America. Tatnell and Swindell got a little too close Saturday at Pike County Speedway, causing the #2 Volcano Joe’s Coffee Schnee to spin – not once, but twice. They started on the front row of the Third Heat Race, collided in the first corner within seconds after the green flag fell and Tatnell eventually finished in seventh place. A collision involving Tim Kaeding and Swindell sent Sammy spinning into Tatnell eight laps into the “A” Feature. The damage to the “Black Deuce” kept Woodward Racing from restarting the race and resulted in a 26th-place finish. “It was really the weekend from hell,” a dejected Tantell said. “We dropped a valve in qualifying on the second lap. I guess we were a little bit lucky qualifying well on our first lap but, as we crossed the (finish) line after our first lap, the motor went sour. “We went in and changed motors and started the heat race on the front row with Sammy. I trust Sammy, I respect Sammy and, basically, I wouldn’t be out here if it wasn’t for the help he gave me. But, in the first corner, I went to dive underneath him and he was able to slow his car down more than I did. I tagged his left rear tire and it turned us around. Coming from the outside and trying to go underneath him, I just got in there and couldn’t slow down enough. I just barely touched him, but it turned us around. That put us at the rear of the field and we couldn’t make enough advances to transfer. But we got through the “B” and into the feature race. Tatnell’s 14.23-second qualifying lap was the ninth-fastest in the 31-car field, only .417 seconds off “A” Feature winner Joey Saldana’s pace-setting lap. The three-time defending Australian Sprintcar champion’s fourth-place finish in the “B” Feature qualified him for the sixth row outside starting position in the 35-lap main event. Woodward Racing’s first DNF of the season dropped the team into sixth place in the World of Outlaws point standings, 18 points behind Karavan Racing. Volunteer Speedway is a high-banked, 4/10-mile oval that features 32-degree banking. The World of Outlaws will sanction the “Hardee’s Southbound Showdown” when it visits Dixie Speedway’s semi-banked, 3/8-mile oval for the second time. Mark Kinser won the only other World of Outlaws “A” Feature at Dixie Speedway – on April 10, 1999. PHOENIX, AZ (March 3) – After running 10th in Friday’s World of Outlaws “A” Feature at USA Race Park, Brooke Tatnell said he needed to start turning top-10 finishes into top-fives. The driver of Woodward Racing’s #2 Volcano Joe’s Coffee Schnee did just that Saturday, racing into third place in the Cactus Classic at Manzanita Speedway. “I didn’t expect to do it tonight, to be honest,” Tatnell said following his seventh top-12 finish in as many races in 2007. “Just knowing we were going to race with a ‘B Game’ – not an ‘A Game’ – tonight, we didn’t expect to run this well. It’s just the dedication of the team (Crew Chief Troy Renfro and Mechanic Rob Beattie). We plugged our way through what we thought would be a bad scenario and made it into something positive. Despite qualifying only 16th-quick in the 36-car field – .314 seconds off new track record holder Kerry Madsen’s 15.235-second lap around the legendary semi-banked, ½-mile oval – Tatnell earned a position in the Dash Race with a runner-up run in the Second Heat Race. A fifth-place finish in the dash put the #2 Volcano Joe’s Schnee inside the third row at the beginning of the 30-lap main event. Tatnell was close behind eventual Cactus Classic winner Donny Schatz during the first several laps, then followed the World of Outlaws points leader past Randy Hannagan as the leaders entered lapped traffic seven laps into the race. Tatnell exchanged fifth place with Tim Kaeding during the race’s middle stages. He drove the #2 Volcano Joe’s Schnee into fourth place, passing front-row starter Justin Henderson deep in the second corner early in the 20th lap. Tatnell chased pole-sitter Paul McMahan for nine laps before claiming third place with an inside move through turn two with only 1¾ laps remaining. “We don’t know a lot about this motor, so we were trying to piece it together and figure out what we need to do fuel-wise and gear-wise,” Tatnell said. “It got faster as the race went on, and the other guys slowed down. It’s not a big-track motor, and this is a racetrack that demands horsepower. The racetrack came back to our speed. Once it slowed down, it suited the speed of our engine. Prior to that, I think it was about two-tenths of a second too fast for us. A tenth or two a lap ends up being a lot, but the track came to us. Tatnell’s first top-five finish of the season pushed him into fourth place in the World of Outlaws standings, only three points behind Terry McCarl. Woodward Racing will have almost two weeks to prepare for the March 16th event at Houston Raceway Park in Baytown, TX. TUCSON, AZ (March 1) – Brooke Tatnell continues to prove he’s one of the World of Outlaws’ most consistent racers. The hard-charging Australian drove Woodward Racing’s #2 Volcano Joe’s Coffee Schnee past five cars to finish in 10th place Friday at USA Race Park. The defending and three-time Australian Sprintcar champion wasn’t content with his fifth top-10 finish in six races, however. Tatnell was the 10th-fastest qualifier in the 37-car field that featured 32 drivers breaking the single-lap record Terry McCarl set last March at the semi-banked, 3/8-mile oval. Brooke’s 12.821-second lap was only .197 seconds off Craig Dollansky’s record-setting pace. Starting outside the front row in the Second Heat Race, Tatnell was poised to finish in the top two and qualify for a position in the Dash Race. Unfortunately, the engine hesitated when the green flag fell, allowing Tim Kaeding to race past. So, instead of enjoying a starting position in the first five rows, Tatnell started the 3o-lap “A” Feature inside the eighth row. Steve Kinser, who started outside the front row, passed pole-sitter Jason Sides during the eighth lap on his way to the 534th of his World of Outlaws career. Tatnell drove the #2 Volcano Joe’s Schnee past McCarl during the opening lap, and was up to 10th place within four laps. He challenged fellow Australian Kerry Madsen and Danny Lasoski for ninth place for most of the race before McCarl came back with a last-lap pass to claim the position. Dollansky collided with Danny Horner and flipped on the front straightaway within seconds after the green flag fell in the “A” Feature. His 25th-place finish allowed Woodward Racing to move into fifth place in the point standings. “It was our first night on this motor, and it stumbled,” Tatnell said. “We had to change a valve a little bit, but we got that organized. We had a pretty good run in the feature race, but we lost one of the plugs out of the water jackets and it’s puking water out. We had a fresh motor, but it’s not so fresh now. It doesn’t help the scenario, but we’ll have to go on down the road. “The block got hot, which got the injectors hot and the throttle was hung wide open. We saw Lasoski blowing smoke and we were blowing smoke, too. It does something to your mindset when you know you’ve lost some control. It was just one of those unfortunate situations. 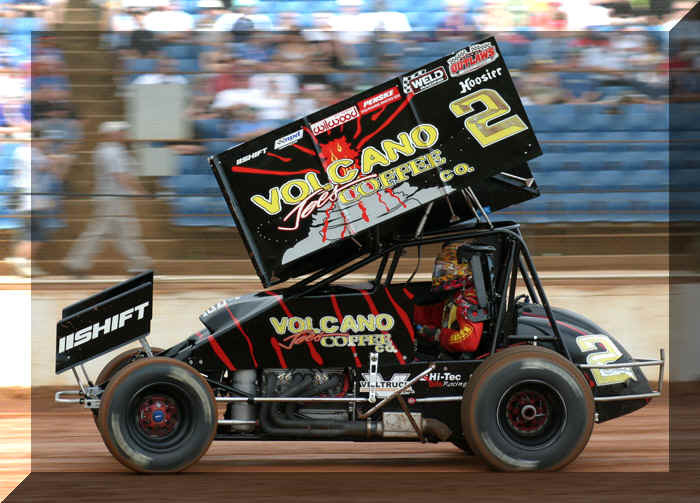 Tatnell will have another opportunity to drive the #2 Volcano Joe’s Schnee into the top five Saturday in the Cactus Classic at Manzanita Speedway in Phoenix.